Today is Black Friday, but there are no great deals before Christmas here. No, these MOT testers got more than they bargained for. And the customers a lot less than they’d bargained for…. Take a look at these examples brought in to MOT garages around the country. 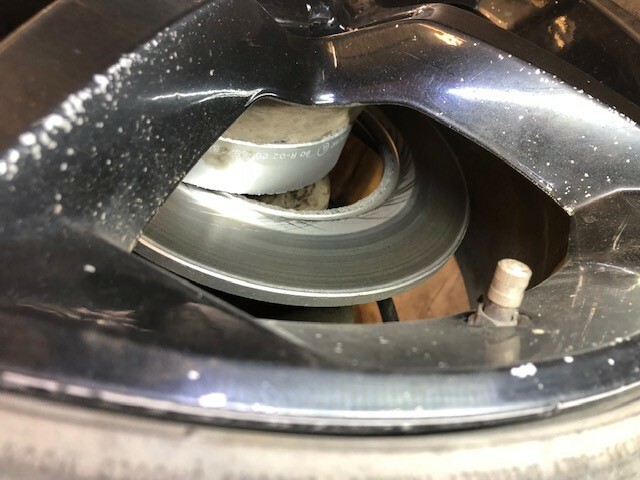 This motorist thought he’d driven a great deal, buying a set of rear brake discs and pads for £35 from a seller on an online auction site. After fitting them himself to his Vauxhall Astra, he drove 10 miles to get an MOT. The brake test done by the garage showed no braking effort from the nearside rear wheel, which put a serious imbalance on the rear braking of the car. Oh, and they found the rear disc had fractured from the hub. The tester is sure the parts were counterfeit and shows the danger motorists can put themselves in when buying from an unknown source. Brett sent us this picture of a Mini, where the tread has lifted and separated from the sidewall. While the tyre looked ok from the outside, even without any air pressure in it, the tester realised there was something wrong as he drove it into the test bay. It turned out one of the run flat tyres had a ‘hole big enough to put your hand in’. When told about this, the customer reflected that the car had been feeling odd, but they’d been driving it around for some time in this condition! The tyre pressure light didn’t come on either so the owner had no idea there was a problem. It’s amazing that the car could run at all. This shows the importance of carrying out visual checks on your vehicle so it doesn’t become a potentially lethal machine. 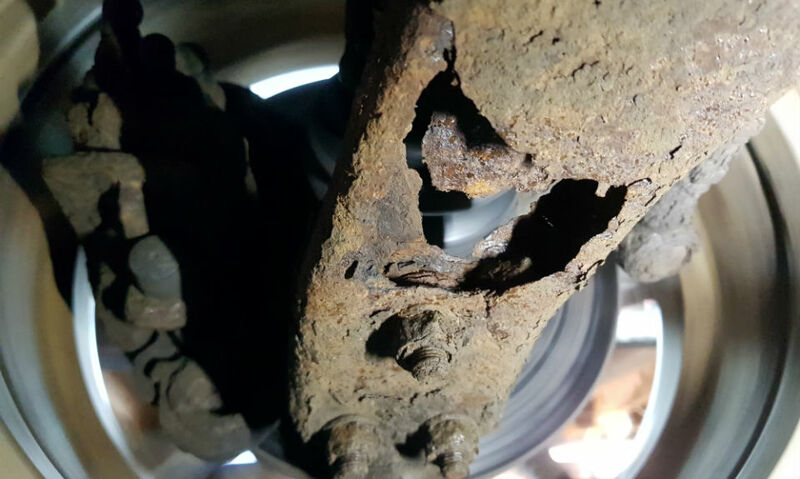 This dodgy repair to a shock absorber and wheel bearing had been done on a car before it got to Robert’s garage. The customer said a national chain were unable to MOT it. To carry out the work, a mechanic would have needed to separate the stub axle from the vehicle. As they couldn’t release the bolt, they cut through the wheel hub to release the old shock absorber and fitted a new one. By sticking a nut on the other end, they hoped to fool the tester they’d put a new one in. But as you can see the old bolt is still there. Lucky that this garage spotted the problem and made the car safe. Ronald’s garage was presented with a 2005 Ford Focus for MOT. It didn’t take him long to spot these massive holes in a lower suspension arm. When told about it, the customer said that, where he came from he was used to just ‘taping a bank note to the offending part’. The tester explained to him that this method wouldn't work at this testing station. Needless to say, the car has now been scrapped. Looks like the repairs were just too expensive! A big thank you for sending in your stories. If you’ve tested a particularly dangerous, ridiculous or outrageous vehicle, please send your photos to socialmedia@dvsa.gov.uk, along with a brief description of what you found and what could have happened if the issues not been found on time. only eggheads could deduce that as no road deaths are attributed to mechanical defects then the MOT is redundant , these are the idiots dictating future policy in all walks of our lives, does scary cover it? So much depends on the garage you work for and the area in which you work. Some of the problems mentioned I have rarely seen, as in the main, the vehicles we test are of a reasonable standard. Whilst we are a Mercedes Specialist, we do all sorts. The point of this comment is that unfortunately, one size does not fit all! But sometimes I am heard to mutter the comment, which idiot thought of this! I'm referring to some of the manufacturers ideas. A welding defect is a weld that hasn’t been done correctly. A defect in original welding won’t usually get past the manufacturing process so shouldn’t get picked up here. But if a wheel has been welded as part of a repair and looks like it may cause a safety issue, the tester is able to fail the item. This emphasises the importance of getting good quality repairs done. Welded repairs are acceptable. In my opinion the frequency of M.O.T tests as it has stood for the last 58 years is the happy medium, and has no doubt saved countless lives. and prevented even more not so serious accidents. Therefore to abolish it would be sheer madness. All for the sake of some £40 per class4 vehicle.. If the Think Tank are so keen to save motorists the equivalent amount reduce the tax on fuel by just 1p per litre!! The fact that vehicle defects are statisticly the least likely cause of all accidents is testament to how well the system as it stands is working. manufacturers need to stop making things out of old spam tins. Also on a seperate subject when they start 3d printing chassis components any alteration or damage is going to have to be a fail because garages wont be able to repair these. Yes, serious faults that should have been spotted on earlier tests. It does put into serious question the thinking of a particular "Think tank" that has the ear of the government, suggesting that the MOT Test should be "scrapped" altogether, claiming that vehicle condition is not a cause of accidents. Is that because the horrors are found and eliminated by conscientious test stations mostly before a serious accident occurs. Does anyone, in all consciousness, really want to play with peoples lives by changing for the worse a system that obviously works? MoT testing stations should be given the power to scrap dangerous vehicles on the spot. Unfortunately there are still garages who would fail vehicles for their own gain if they were allowed to scrap on the spot. I know what you're saying but, in the picture, you can quite clearly see the sticker on the shock absorber saying "do not heat, gas under pressure". I have an induction heater but I'd be very wary about getting that area much more than mildly hot! I'm afraid all of these truly horrific stories come back to the same issue. Car owners, by and large, resent spending money to keep their vehicles safe. From the buying the cheapest pads and discs you can get, through the knowing the car drove badly on the tyre to the taping a banknote to the bottom arm. It ALL comes down to being willing to risk lives to save a few pounds. And then you get politicians wondering if the test should be done away with to take the financial burden off the motorist. Mind boggling! One explanation for a vehicle getting an MOT pass when such obvious faults are found, is not because of poor testing standards by the NT but it's ignored because the vehicle belongs to a friend or colleague. So rather than fail it, the NT takes the risk and gives the car a pass to keep everyone happy. One obvious example of this, although admittedly not a high safety factor defect, is 8.1 of the MOT testing manual 'Noise'. The high levels emitted from the big bore sports exhaust systems is frequently ignored and a pass issued. Exhaust noise from the vehicle must not be unreasonably above the noise level you'd expect from a similar vehicle with a standard silencer in average condition. People that put an exhaust like that on will only take it off, pass the test and then put it on again. I know you are right but really its a waste of time. An Mot literally saved mine and my partners lives. My car was well maintained but there was no way I would have spotted the bulge the size of an egg on the inner wall of the front tyre. Dread to think what could have happened if it burst. The focus suspension arm further strengthens my belief that mots should be every 6 months then that fault would have been caught earlier. Although looking at the amount of corrosion I think that has happened over a few years. A number of lives have most certainly been saved by the mot testers inspecting these vehicles. They are all potential death traps that have been presented for test, proving that a vast majority of car drivers have no idea of what’s going on beneath them, or simply don’t care. A lot of mot customers sound surprised when there car fails, but mostly always tell you they can’t remember the last time they checked even basic items prior to a journey. I repair vehicles daily. And test daily. The sheer amount of "garden-driveway mechanics" is appaling. And it seems every single person in the UK is a mechanic. It doesn't matter if its a middle aged woman or an elderly person to a young person... they all "think" they're a mechanic....."my mate says syndrome" well in google.......... it says this is fine. I spent 3 years at college. And this is my 22nd year in the trade. Your quick 1 minute google search is obviously better than my experience. Rant over. Bring in 6 monthly tests!! For a short time I worked for a well known national chain, the standard of work they carried out was at best poor, and the selling practises were dubious. The activities were sanctioned by the head office and area managers and as a result I left their employ, I didn't want to be associated with their practises. Most vehicle enthusiasts are better at maintaining their vehicles than a garage would be, they tend to have a better knowledge of their particular vehicle and are willing to spend more time on repairs and use better quality parts, because the vehicle is their passion. On several occasions I have been called upon to rectify welding work carried out by garages. It is unfair to group home/diy mechanics in with those few who have no knowledge and bodge repairs. In my opinion it is the motor trade that requires more regulation and inspection. These are the sort of things that can be seen, my worry is all the parts manufactures are now covering up with plastic covers making it impossible to see.Some manufactures seem to get different rules to work with as well !How come some can have a different amount of play in a ball joint or a strut top mount. That's the whole point of having an annual MOT test, so a vehicle can't be driven on the road with defects such as these. Don't think you should be too shocked about it. I don't like the suggestion that if you fix a car yourself instead of paying a garage £100 an hour, the repair is somehow sub-standard. I have always repaired and welded my own cars, always to MOT standard and above, and certainly way better than many "mechanics" I have seen. Suggest you stop having a go at the man in the street. ref heavier corrosion tool,spot on i couldn’t agree more. if we advise lower arms are corroded like lower arm bushes, we no they are at the end of their life but we have to pass n advise. mots should be like the old taxi tests.2mm over whole tyre, bottom arm bushes separating fail make it black n white. I keep my car, my son's car and my wife's car in tip top condition. Always pass the MOT with no comments. I'm not bragging ,it just saves time and inconvenience in the long run. I don't understand vagabonds who scrimp on repairs to a point the vehicle is unsafe. If you can't afford a car don't drive one. Read the articles again and then re-assess your comments. 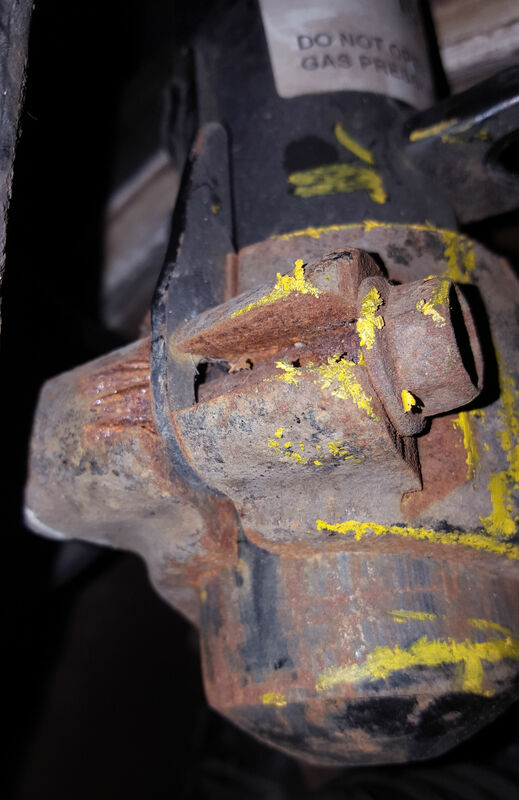 maybe its about time we had a new separate heavier corrosion assessment tool for suspension arms ?, on some vehicles these rot out before the body/chassis does. they need a more substantial assessment as they are thicker metal, but corrode dangerously thin and present a serious road risk , more so that a corroded sill does. Have been saying this for years,sort it out DVSA. 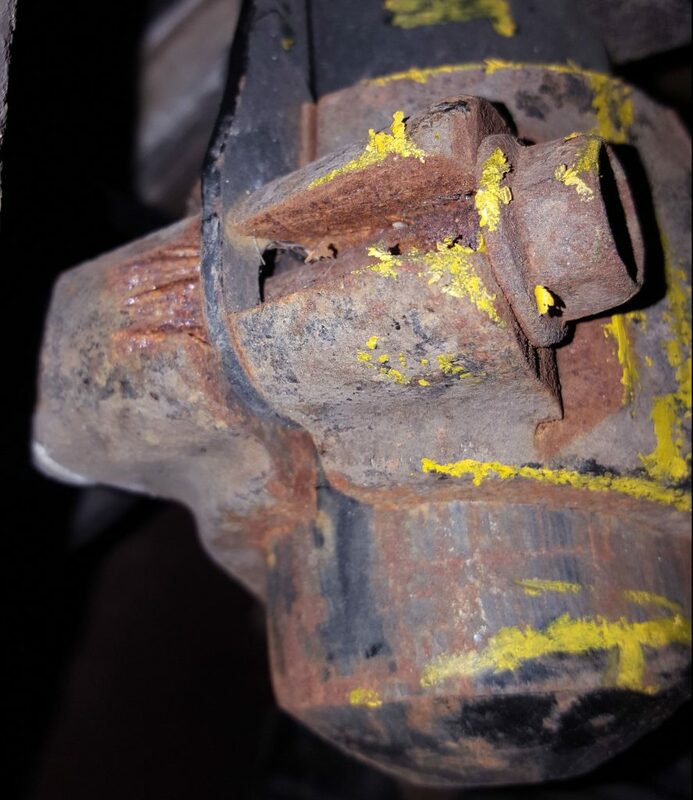 Something that crops up these days is severe corrosion in suspension components themselves rather than mounting points for such on the car. Cost-cutting by manufacturers is making them make these from cheap steel pressings rather than forged components. The throw-away philosophy means we have to be even more vigilant. Switzerland, first MFK (MOT) 3 years old, then every 2 years, unless it's pre-1972 then every 6 years. You get invited to have it done, appt sent to you via mail 30days before. Most people go and get a pre-MOT done at their local garage/dealer. Then when it's due, prepare to sit there for several hours, the car needs to be clean, top to bottom, inc interior, not leaking of fluids, no rust on working surfaces this shows them that you care about your car. The test costs @ £250-300, not including the pre-MOT. You can also have an 'invite' sent at anytime, failure to show up or not get it done will result in a call to Police who will come round and remove your license plates, which in turn invalidates your insurance. Most people fear it, as they should. Cannot have it with non-OEM wheels, etc! That's a fail. What's more worrying is that some one Mot'd that car last year and didn't fail it then , the standard of some peoples mot's are appalling . What makes you think the fault didn't develop over 12 months? Your conclusions about the defects leave your mechanical ability in doubt which is even more worrying seeing as you oversee the mot test and its standards. Might explain why the manual is still not sorted out properly. Taping a bank note to the offending part? I wish I'd known about that system, I've been wasting thousands over the years on repairs. These are just a few of the dangerous defects that are found on a daily basis as part of the MOT test, and further validates the need not to reduce the testing age or frequency of vehicles on our roads. MOT’s save life’s.